Dimensions: 4" x 96" x 96"
Commissioned by the Abiquiu Chamber Music Festival, 2010 in conjunction with R. Carlos Nakai, preeminent Native Flute player presenting the world premiere of ReWeavings composed by Ruth Lomon. The wall hanging is focused on the cross of Spiderwoman, the original Native American weaver of the Dineh cultures. Her colors are used here, the red and black of the black widow; and these plus the grey have typically been the basic colors of every Navajo's first blanket. The diagonal line to the edge is also traditional: it offers an escape route for the spirit. The surround for the crocheted cross here is 160 columns of roving wool, referencing the years since 1850, during which the US government has provided the context for the Native Americans' cultures in Abiquiui and elsewhere. 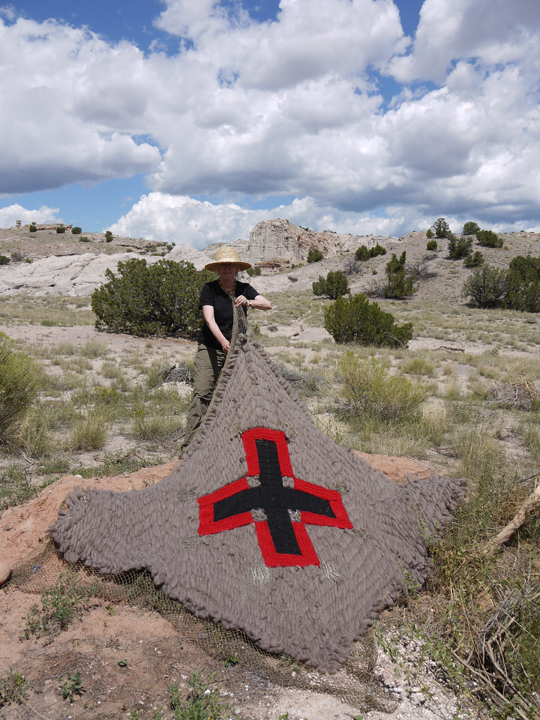 The directional cross incorporates grasses gathered from lands north, south, east and west of Abiquiu that were once Anasazi, Pueblo, Navajo, Ute, Jemez, Ohlone and others. Blue wild flowers in the central squares reference the sky above.